The Gulf of Fonseca lies on the west coast of Central America, nestled at the intersection of Nicaragua, Honduras, and El Salvador. 61,000 hectares of wetlands and bays in the Gulf form a critical migratory and wintering area for hundreds of thousands of shorebirds every year, including several hundred American Oystercatchers. American Oystercatchers are found in low numbers on the Atlantic coast of North America from Maritime Canada to Florida, in the Gulf of Mexico from Florida to Mexico, and on the Pacific Coast from Southern California through the Sea of Cortez and down the west coast of Mexico. American Oystercatchers occur on both coasts of Central and South America where suitable habitat is available, but usually in low numbers—and, until recently, we assumed that these individuals are generally non-migratory or only move short distances. The mudflats of the Delta del Estero Real, in the southeast section of the Gulf, were designated as a Western Hemisphere Shorebird Reserve Network (WHSRN) Site of International importance in 2016, the Network’s sole site in Nicaragua and only second site in Central America. 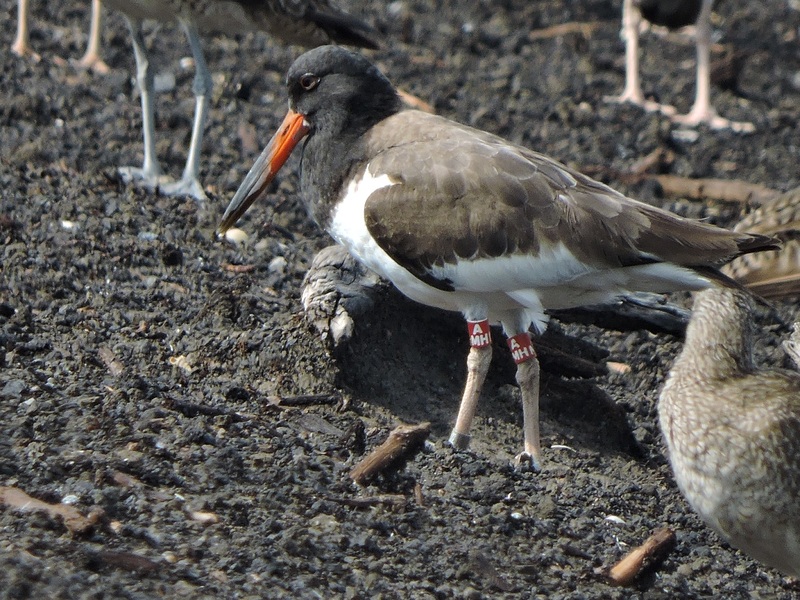 In 2013, an initial shorebird survey by Orlando Jarquín and a small team discovered three banded Oystercatchers mixed in with a roosting flock in Nicaragua. The team was able to connect with the American Oystercatcher Working Group in the United States, which maintains a cooperative database of over 5000 individually banded Oystercatchers, They traced the letter, number, and color combination on the bands to learn that two of these birds were banded in Virginia during the nesting season, and the other was banded in Georgia during fall migration. This discovery was the first step in changing conventional ideas about the range and connectivity of American Oystercatchers nesting in North America. 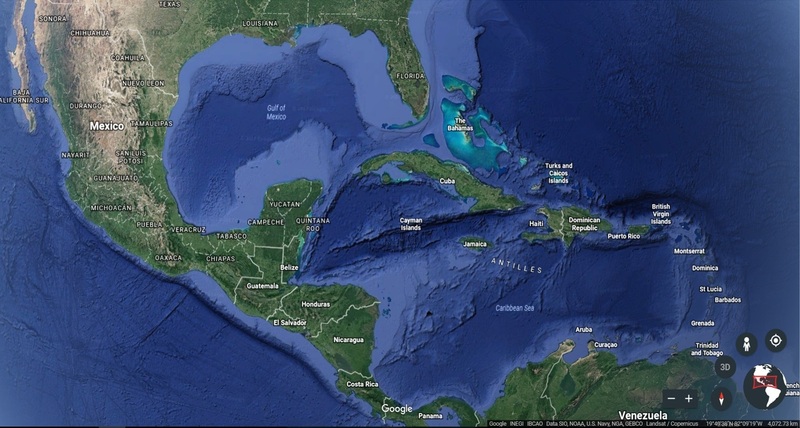 Previously we had assumed that there was some movement to Caribbean islands, but otherwise believed American Oystercatchers breeding in the United States typically did not leave North America in the winter. 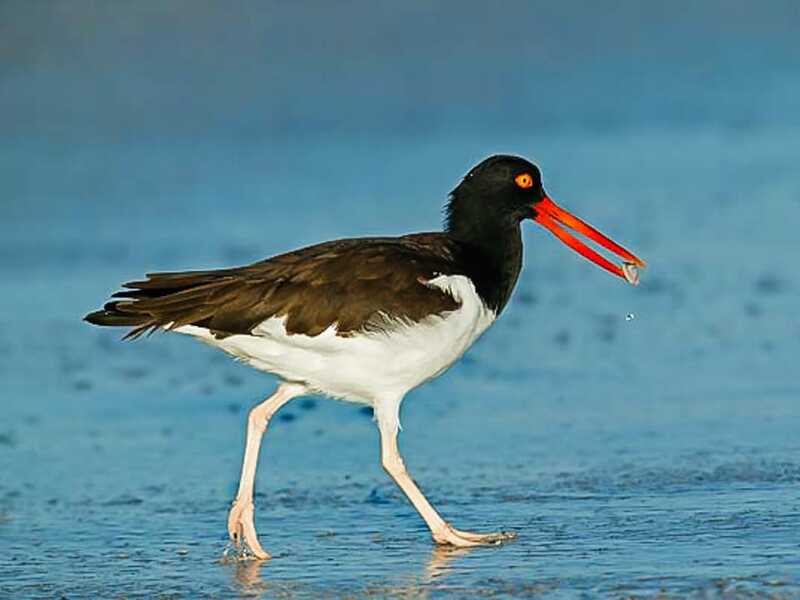 Subsequent surveys for the Migratory Shorebird Project found more banded Oystercatchers from the East Coast of the United States and strengthened the evidence for a connection between North American and Central American Oystercatcher populations. 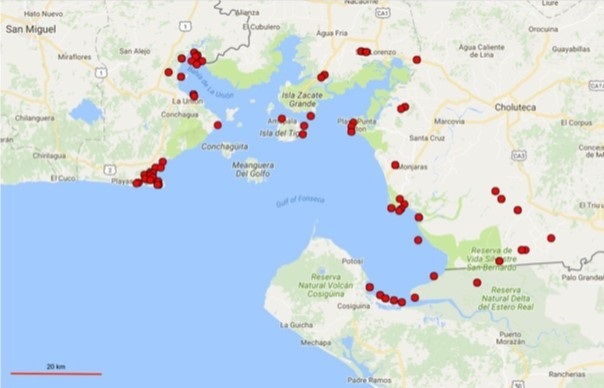 In 2017 and 2018, with funding from Manomet, Jon Van Dort (Asociación Hondureña de Ornitología), Orlando Jarquín, and an experienced field crew conducted the first tri-national surveys of shorebirds in the Gulf of Fonseca. The results were impressive. They estimated that approximately 200,000 shorebirds were using the Gulf of Fonseca during the winter months. The comprehensive surveys also identified many new banded Oystercatchers and documented movement of the banded birds among all three countries in the Gulf. To date, 16 individual banded Oystercatchers from seven US states have been found in the Gulf of Fonseca. Red F3, one of the birds spotted in Nicaragua, was initially banded during fall migration in 2005 on Little St. Simons Island on the coast of Georgia—by Manomet’s very own Brian Harrington and Brad Winn! Before the sighting in Nicaragua, the same bird had been found nesting on a sandbar in coastal Connecticut. On an annual journey from New England to Georgia to Nicaragua, birds like Red F3 (pictured below. Photo courtesy of Erika Reyes) unite the Atlantic coast (where they breed) with the Pacific coast of Central America. These observations demonstrate that many Oystercatchers do migrate outside of the United States, reinforcing that conservation and collaboration at international wintering and stopover sites will be an important part of the long-term recovery of the species. Some of the American Oystercatchers found in the Gulf of Fonseca had been previously sighted at stopover and wintering locations in the southeastern United States. Without the surveys in Central America, we would have assumed they remained in these flocks for the rest of the winter. In fact, it is now clear that some of the birds are actually using these sites in the southeast United States as stopover points, and continuing on across the Gulf of Mexico to reach their wintering grounds. Plans are in the works for the third tri-national shorebird survey in the Gulf of Fonseca in the fall of 2019, which will be a great opportunity to look for more banded birds. 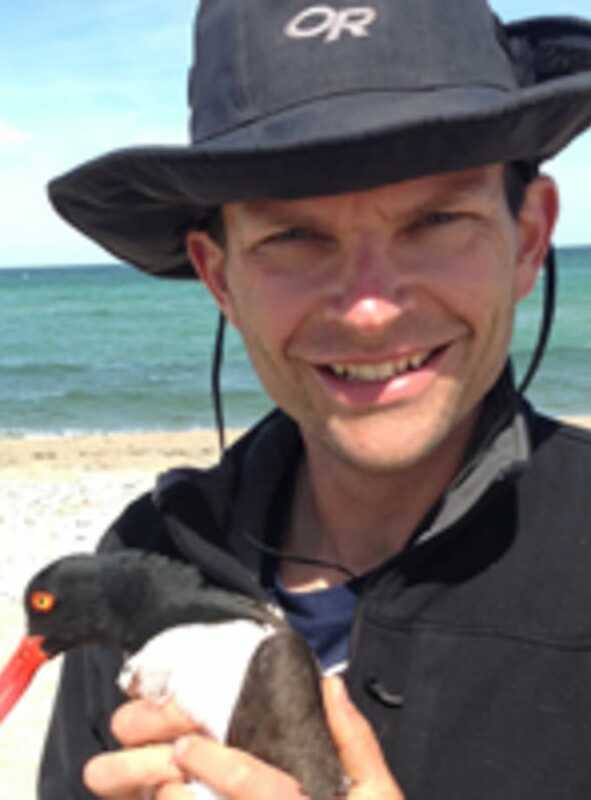 Manomet hopes to continue supporting these surveys and similar work in Central America improving our understanding of connectivity, migration, distribution, and size of the American Oystercatcher population, and to aid in the conservation of critical sites for migratory shorebirds.